Little Bluebell: Last Day to WIN Castle Peeps! 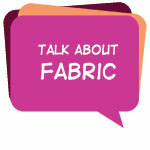 Remember, if you add the Talk About Fabric Button to your blog, you are automatically entered into every contest we ever host. Any color button you want. Cool right? ?